Machgielis Euwe (pronounced uhr-vuh) was born in Amsterdam on May 5, 1901. He learned chess at the age of 4 from his parents. In 1921 Max won the national championship of the Netherlands. He would win it eleven more times in his career. Euwe then played a match with Geza Maroczy of Hungary. Euwe drew that match with 2 wins, 8 draws, and 2 losses. In Vienna 1921 he took second place behind Friedrich Saemisch of Germany. In 1923 Euwe graduated with honors from Amsterdam University, majoring in mathematics. He gained his PhD in mathematics in 1926. Euwe was also an amateur boxer and won the amateur heavyweight boxing championship of Europe. Euwe won Wiesbaden 1925 with 3 wins and 3 draws. In 1926-7 Euwe played Alexander Alekhine in a match and narrowly lost with 2 wins, 5 draws and 3 losses. In 1928 Euwe defeated Edgar Colle in a match with 5 wins and 1 draw. A few days later he played Efim Bogoljubov in a match and lost, scoring 2 wins, 5 draws, and 3 losses. In August, 1928 Max Euwe won the 2nd and last world amateur championship, played at the Hague. 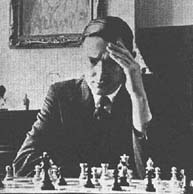 In 1930-1 Euwe took first place at Hastings, ahead of Capablanca, with 6 wins, 2 draws, and 1 loss. He then played Capablanca in a match, but lost with 8 draws and 2 losses. Euwe took 2nd at Bern 1932 with 8 wins and 7 draws. He then drew a match with Salo Flohr with 3 wins, 10 draws, and 3 losses. He won a training match with Rudolf Spielmann in 1932, with 2 wins and 2 draws. Euwe took 2nd place at Zurich 1934. Euwe tied for first place with Flohr and Thomas at Hastings 1934-5. Ewue played another training match with Spielmann in 1935, but lost. In October-December, 1935 Max Euwe played Alexander Alekhine for the world championship and, to the surprise of everyone, won the match. The match was held in Amsterdam, The Hague, Delft, Rotterdam, Utrecht, Gouda, Groningen, Baarn, Hertogenbosch, Eindhoven, Zeist, Ermelo, and Zandvoort. There were 23 different locations that this world championship match was held at. Max Euwe had won 9 games, drew 13, and lost 8 to become the 5th official world chess champpion. This was the first world championship to officially have seconds to help analyze after adjournment. At Zandvoort 1936, world champion Euwe came in second, place, behind Reuben Fine, with 5 wins, 5 draws, and 1 loss. He took 3rd place at Nottingham 1936, behind Capablanca and Botvinnik and tied for first at Amsterdam 1936 with Fine. In 1937 Euwe took first place at Bad Nauheim-Stuttgart-Garmisch, ahead of Alekhine, winning 3, drawing 2, and 1 game. From 1935 until their rematch in 1937, Max Euwe scored two wins and one draw against Alekhine. In October, 1937 the Euwe-Alekhine rematch took place in The Hague, Rotterdam, Amsterdam, Haarlem, Leiden, Groningen, Zwolle, and Eindhoven. Euwe lost with a score of 4 wins, 11 draws, and 10 losses. Euwe won at Amsterdam-Hilversum-The Hague in 1939 with 4 wins and 6 draws. In 1939-40 he lost a match to Paul Keres with 5 wins, 3 draws, and 6 losses. At Budapest 1940 Euwe took first place with 4 wins and 1 draw. In 1941 Euwe traveled to Carlsbad and defeated Bogoljubov in a match with 5 wins, 3 draws, and 2 losses. After World War II, Euwe took second, behind Botvinnik, at Groningen 1946. After the death of Alexander Alekhine in 1946, the World Chess Federation, FIDE, assembled in 1947 and the delegates decided the Euwe should become world champion pending the next championship match. The Soviet delegates, arriving late the next day, had the decision annulled, and the title should be vacant until a match or tournament was played to decide a new world chess champion. The world championship match-tournament held at The Hague and Moscow in 1948 was won by Mikhail Botvinnik, who became the 6th world champion. Max Euwe took last place among Botvinnik, Smyslov, Keres, Reshevsky, and himself. He scored only 1 win, 6 draws, and 13 losses in this event. In March, 1957 Max Euwe played Bobby Fischer in two unofficial games in New York. Euwe one one game and drew the second game. Max Euwe was elected president of FIDE in 1970 and held the post for 8 years. He traveled to over 100 countries at his own expense during that time promoting chess. Over 30 new member countries joined FIDE due to his efforts. Max Euwe died in Amsterdam on November 26, 1981. Max Euwe won 14, drew 30, and lost 31 world championship games. His historical ELO rating has been calculated to be 2660. He played about 600 tournament games in his career, scoring 57 percent.